KANSAS CITY, MO – Researchers at the Stowers Institute for Medical Research have identified "navigator" neurons that are key to setting up connections in the system responsible for the sense of smell. The new study builds on a breakthrough 2014 report from the laboratory of Stowers Investigator Ron Yu, Ph.D., which showed a critical period in olfactory wiring using mice as a model system. The olfactory system depends on a complex web of neural connections to detect odors. 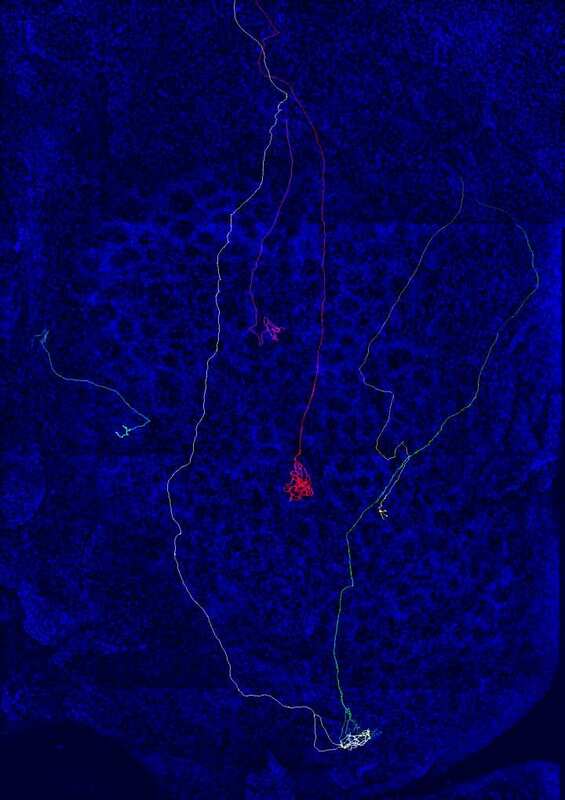 Olfactory sensory neurons in the nose pass information through their axons to the brain's olfactory bulb for further processing. Neurons with the same receptor reach out, or project their axons, and connect to the same spot in the brain, called a glomerulus. This convergence forms an olfactory map, and it acts as a kind of code book for the scents we encounter. Glitches in the map's wiring affect how scents are perceived. Previously, researchers thought that since olfactory neurons regenerate and replace themselves throughout the life of an animal, they kept the ability to re-establish correct connections. Yu and his team found that wasn't the case. They used a number of transgenic mouse lines to demonstrate that the first week after birth is a critical window of time to fix problems. If mis-targeting is not corrected during this period, cells still regenerate, but many get locked onto the wrong tracks. In their follow-up report published online October 25, 2018, in Neuron, the researchers detail the unexpected discovery of a group of olfactory sensory neurons, or navigator neurons, that play an essential role in establishing the olfactory map and correcting faulty connections. "The results indicate that the map of neural connectivity is set early in life by a group of neurons that only exist during the critical period. Neurons generated at an adult stage do not have this capacity," says first author Yunming Wu, Ph.D. At the time the research was conducted, Wu was a predoctoral researcher with Open University. The discovery of navigator neurons is the culmination of five years of research conducted in the Yu lab, aimed at distinguishing early-born neurons from later-born neurons. Because navigator neurons look identical and function the same as neurons born later, it took a variety of creative approaches to finally pinpoint them. The researchers used a combination of approaches and technologies to identify the neurons. Chronogenetic tracking, a method developed in the lab, allowed them to trace a neuron's lifespan using genetic labeling across a mouse's entire life. They constructed an adenovirus to carry genes into the neurons so they could clearly label individual axons emanating from the neurons. By combining virus labeling and CLARITY, a technique that makes samples of mouse brain tissue transparent, they obtained entire trajectories of axon projection into the olfactory bulb. They also used single-cell transcriptome analysis to characterize the molecular identity of the cells and changes of gene expression during development. Used together, these methods demonstrated that navigator neurons are distinct from other olfactory sensory neurons. The researchers found that the neurons undergo a phase of exuberant axon growth and have a shortened lifespan, as well as distinct molecular signatures. By extending the lifespan of navigator neurons, they prolonged their period of exuberant growth and stopped the axons from converging. They also found that while all of the olfactory sensory nerves were able to regenerate, only the navigators had the ability to establish a convergent map. Navigator neurons also have very different trajectories when they're projecting during early development – roaming around instead of going straight to the glomeruli. This behavior may help them correct improper connections, because they are able to find new connections by sampling a much larger area. Learning more about the mechanisms driving navigator neurons, and their role in establishing olfactory map wiring, could hold promise for regenerating and repairing olfactory neurons and neurons in other types of neural systems, such as those involved in spinal cord injury. Finding out how to make later-born neurons that have lost their ability to regenerate and connect correctly behave like navigator neurons might be the key. "We know that when there's trauma-related anosmia, the sense of smell is lost because of the severing of connection from sensory neurons to the olfactory bulb. When the axons get cut, even when they regenerate, if they cannot re-form the connections properly, you would still lose the sense of smell or have an altered perception of smell," Yu says. "If we can understand this process involved in early development – if we can reopen the critical period- we may be able to let regenerating axons find the right target when they are projecting back. This study is a step towards that goal." In addition to Yu and Wu, other study contributors from the Stowers Institute include Limei Ma, Ph.D., Kyle Duyck, Carter Long, Andrea Moran, Hayley Scheerer, Jillian Blanck, Allison Peak, and Andrew Box. This research was assisted by Stowers scientific support teams including Computational Biology, Cytometry, Laboratory Animal Services, Microscopy, and Molecular Biology. The study was funded by the Stowers Institute for Medical Research and the National Institute on Deafness and Other Communication Disorders of the National Institutes of Health (award R01DC016696). The content is solely the responsibility of the authors and does not necessarily represent the official views of the National Institutes of Health. A newly discovered group of "navigator neurons" may hold the key to understanding the neural circuitry behind our sense of smell. The study builds on a breakthrough 2014 report from the laboratory of Stowers Investigator Ron Yu, Ph.D., that showed a critical period in olfactory wiring. Glitches in the wiring affect how scents are perceived. Yu and his colleagues found that in mice, there's a brief window to fix problems – about a week after mice are born. In their follow-up report published online October 25, 2018, in Neuron, the researchers detail the surprise discovery of a group of olfactory sensory neurons, or "navigator" neurons, that play an essential role in establishing the olfactory map, a kind of code book for the scents we encounter. The navigator neurons also correct faulty wiring that can impair the sense of smell. Because navigator neurons look identical and function the same as other neurons, the Stowers researchers creatively employed a variety of approaches and technologies, some they developed themselves, to finally pinpoint them. Learning more about navigator neurons could hold promise for regenerating and repairing olfactory neurons and neurons in other types of neural systems, such as those involved in spinal cord injury. The Stowers Institute for Medical Research is a non-profit, basic biomedical research organization dedicated to improving human health by studying the fundamental processes of life. Jim Stowers, founder of American Century Investments, and his wife, Virginia, opened the Institute in 2000. Currently, the Institute is home to about 500 researchers and support personnel, over 20 independent research programs, and more than a dozen technology development and core facilities. Learn more about the Institute at http://www.stowers.org and about its graduate program at http://www.stowers.org/gradschool.